Every time when I see mushrooms, I try to think of making it differently. I don know, Y ..only with mushrooms ? May be I love them a lot or may be I wanna give a hint of flavours since it's just bland. Today I started off cooking with the thought of making pepper mushrooms , but somehow, I ended up making Ginger fry.. It turned out to be good. Waiting for my H (VJ) to give some critics about this dish..
Clean the mushrooms and chop into big chunks. In medium flame heat the karahi and add the oil. Saute the onions finely and add the ginger paste and fry well. stir until it starts sticking to the bottom. Throw in the chopped garlic and combine well. let it half cook in the oil itself. Now add the chopped tomatoes and cook until it gets disintegrated . ( If u don like ur mushroom to be gravy type, u may skip adding it . ) Then add the chopped mushroom ,salt and shallow fry for a minute or so. Add the red chilli powder, turmeric powder, garm masala powder . Combine well. Cover and continue to cook the mushroom in medium low flame for 5 minutes or until fully cooked. Finally add the lemon juice and mix well. Remove from the heat and place on the serving bowl. In a seperate pan add little bit of oil and fry the curry leaves and saute the ginger for few seconds. Transfer this mixture to the serving bowl and add on the top. Serve warm..
Thats a wonderful looking mushroom fry,yummy.. Delicious looking mushroom fry..nice recipe dear. Great looking mushroom fry...like your idea of giving a tadka in the end...will sure keep this in mind next time making mushroom fry..
Yummy looking Mushroom Fry Shanavi. Would try out your method next time. ginger mushroom fry looks delicious. 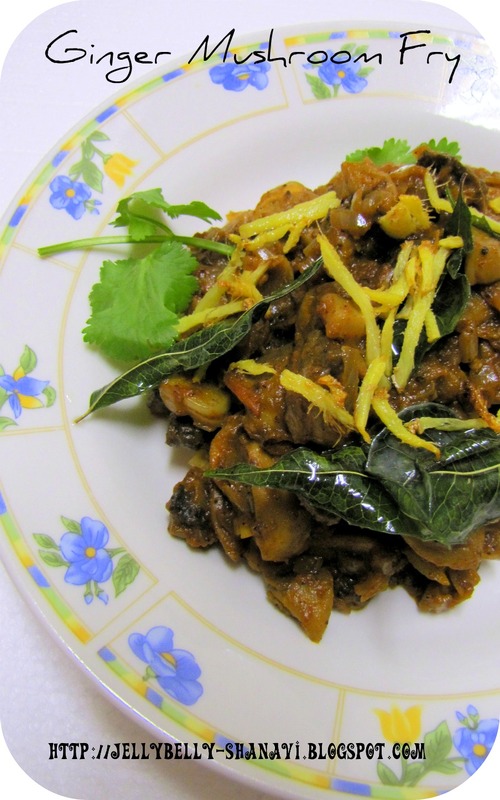 Sho supera irukku & ginger with mushroom very tempting combo.. Interesting recipe! they look appealing too! looks spicy and mouthwatering fry!! Flavourful and delicious mushroom fry.